Very large village with over 50 medieval styled houses. Still in process. Has a track to the a stronghold. Made entirely in survival with no cheats. A massive castle with several floors inside it. All built by hand. Several secrets and a whole other fort if you can find it (hint, go to the mines). Will update often please leave comments on what to build next. kitchen, defenses, archery range, library, Furnace, Meditation room, mine, arboretum, wall defenses, lighthouse, boathouse, village, armoury, watchtowers, dorms, Wine cellar, traps, servant quarters. Iskandria is a world of wide variety. It is a flatworld with depth. There are mines and all the usual. I have built everything except for one or two of the vanilla trees that snuck in myself. Mountains forests, all of it. I have a detailed story for my world. After the background I will add some info on the features of different areas. Thousands of years ago, when man was a primitive cave dwelling race, the Ancients were at their height. They were masters of genetics and redstone. Tall and ivory, they were cold and ambitious. They engineered the pigmen to mine the nether for the quartz they used to build their empire. This resulted in the Nether Wars. The Ancients won, but they never recovered from the conflict. The Nether claimed the pigman as their own, though a few escaped, later to die out, and built subterranean cities. As the Ancients went into decline, the humans built their first civilizations Sumerkaad and Mezaztec. The greatest of the Sumerian cities still thrives in the South. Men spread further and also founded the Empire of the Gone, Entropy worshipers who revered the Enderman. The dying Ancients feared the potential of these men and attacked them with their engineered Creepers and zombie viruses. This was the last stand of the Ancients. The race is survived only by the fallen undead, now known as wither skeletons. The Gone were all but destroyed as well. Their decedents are only now rebuilding Entroplolis. The endermen revere incredibly old pinnacles of their race. The first of these is Pale Ender, the Unknown. Eight armed and three eyed he is the chief of the scientist gods of the endermen. The others are Shaxivantya, She of the six arms, Vhabravarra, the three eyed and wise, Savrashantyi the pale and fertile, and Astyvalva, the winged. They despise but placate Necrottii, the eyeless raw fleshed Netherlord. They have expansive cities both in the End and on Iskandria. The Nether is contested by Ereshkigal of Sumerkaad, Lucifer, Azmodeus, Mephistophelis, and Necrottii the Enderdemon. The Blazes, quadriplegic undead and other horrors serve all of the infernal factions. The overworld territory of Acheron belongs to Mephistopheles. The current kingdoms of man are Tamaan, whose capitol is Odemis, the young prince/king is cruel and petty but not wholey evil. He is close to his elderly Chancilor. Marranoor and the other cities in the region are part of Tamaan. Eanna, city of the Goddess Inanna-Babalon, the Capitol of Sumerkaad minds its own business. The New Gone are rather neutral but they dabble in the dangerous territory of the Endermen. They are overseen by the Entromancer from his vast Rook Keep in Entropolis, but rule themselves for the most part. The Endomancer is at odds with Tamaan. The Eastern land of Nippon is mostly benevolent. The withered forest in the North is the domain of Barron Makchizadek. He is a large warrior with a talent for black magic. He worships the Lightbringer, Lucifer. He is a threat to the entire world. TELEPORTATION BLOCKS, hidden across the world are command blocks that allow access to the floating islands...A bat or something triggers one in the Ender city a lot, if you blink somewhere else suddenly while there that is why. At least I think that is what is doing it. ODEMIS, There is a house with a passage to the caverns of the zombie pigmen. They will spawn there. The city has consulates from most of the other cultures. There is a clock tower and a temple of Thelema as well. ENTROPLOLIS, The only city with an embassy for Endermen. There is a huge labyrinth beneath the Rook Keep. An ideal place to put a Wither. The huge temple of Ender in the North Eastern corner is a building that I am very proud of. There is a command block teleportation to one of the towers. The coliseum was an achievement for me too. EDO has outside of its walls Fujiyama (Mount Fuji). EANNA has a portal to the nether in the zigurat of Inanna. The MEZAZTEC area sits above a huge temple to Cthulhu and one of the zigurats has a shaft all the way to the bottom of the world. THE END has an enderman city and is far larger than typical Minecraft Ends. It is downright massive. THE NETHER has several things on its top, there are ladders to reach it at the zero point and elsewhere. 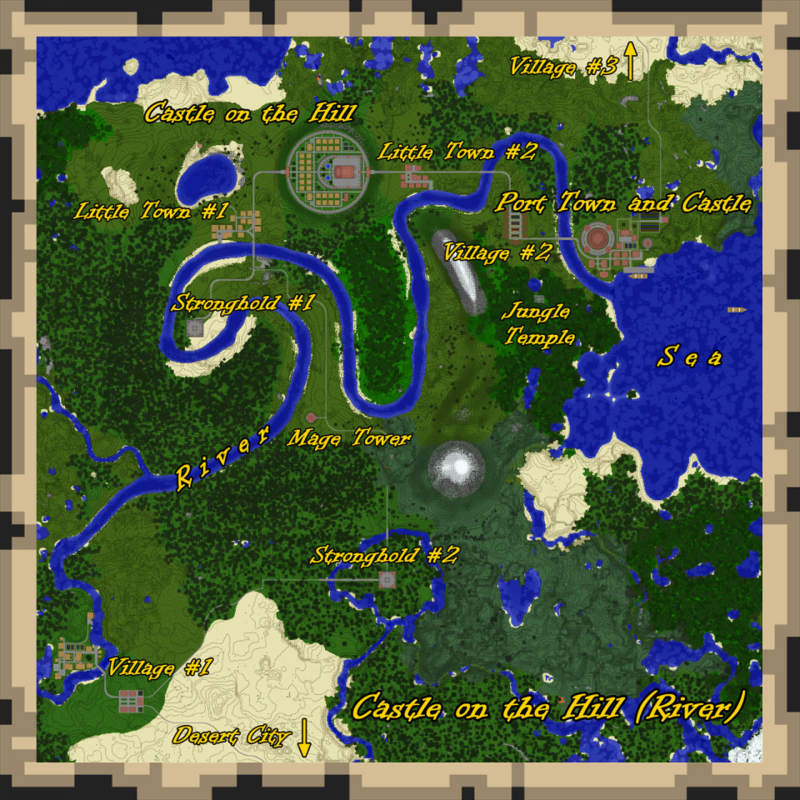 The official Archland server map! Archland is a north European server hosted in Norway with somewhat of 40 players registered, sadly, many seem to have moved on, leaving our server with barely 15 regular players. It is open 24/7, survival hard and any building style is permitted with a map of 2500x2500 No lagg at ALL! We also permit looting and killing of others, but not destruction of structures. Also, since one can lock chests, its rare to find a possibility to loot anyone. We've started accepting new players in and started planning 7 cities and the construction of one, a Steampunk style port city. Later a Pirate based city, Arabic style city, Viking/Norse style and some others. Each city can be in wars or alliances with others, trade routes and personal roles have already started appearing.